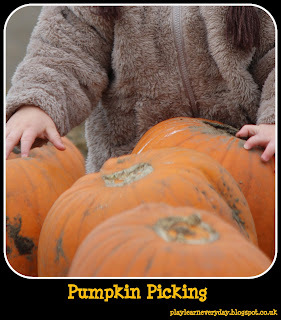 Today we went pumpkin picking! There's a great farm, not too far away that we went to last year as well, it's now one of our family traditions. This year was different, because now we could let Ethan crawl amongst the pumpkins, he got very muddy, but it was worth it! It was great walking practice for Ethan as well, because he held our hands and did some finger walking amongst the pumpkins, great for his Physical Development. It's also just a great thing for him to see vegetables growing in the ground and begin to make connections as to where food comes from, excellent for his Knowledge and Understanding of the World. Follow Play & Learn Everyday's board Halloween on Pinterest.